As lab seizures and restrictions on sales of products containing pseudoephedrine dry up meth production in parts of the United States, law enforcement officials are becoming increasingly concerned that the void is being filled by the Mexican meth trade. According to the U.S. Drug Enforcement Administration, 65 percent of all meth consumed in the United States now comes from Mexican drug cartels: 53 percent from superlabs in Mexico itself, and 12 percent from Mexican-run superlabs within the U.S. The cartels who so efficiently established super labs in the West Coast in the mid-90s are now moving operations to Mexico, where restrictions on the precursor chemical, pseudoephedrine, have, until very recently, been nonexistent. In 2004, Mexico imported 224 tons of psuedoephedrine, a figure estimated to be double the national demand for cold medicine, and quadruple the 66 tons imported in 2000. To supply their super labs, the cartels are obtaining the chemical in mass quantities, either in bulk directly from overseas suppliers, or from local pharmaceutical companies making legitimate cold pills, or via bogus pharmacy fronts. 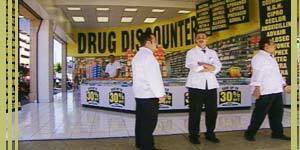 In November 2005, the Mexican government pledged to set a limit on imports of psuedoephedrine and reduce the number of pharmacies selling products containing the chemical. FRONTLINE spoke with The Oregonian's investigative reporter, Steve Suo, about Mexico's drug trade and whether Mexico's proposed reforms or the passage of the 2005 Combat Meth Act, still pending in Congress, will make a difference. Suo reported for FRONTLINE's "The Meth Epidemic" and his extended interview on the story can be read elsewhere on this site. | "Mexicans take over drug trade to U.S."
With Mexican meth moving in to supply Americans' meth habit, what can we expect if the 2005 Combat Meth Act passes -- will it help deal with Mexican meth? …there are provisions in the Combat Meth Act that deal with the issue of Mexico. There is language that requires the State Department to determine the total production of pseudoephedrine worldwide, compared to the legitimate need for pseudoephedrine worldwide, and also says that the State Department should look at the largest importing countries, and determine whether their imports square with legitimate need. So, countries such as Mexico which are major importers would come under review, and if they're failing to take adequate steps to control the diversion of pseudoephedrine, they could potentially lose U.S. foreign aid. In addition, the federal bill also would allow the DEA to obtain the sales records of the foreign manufacturers of pseudoephedrine, which are located in only a handful of countries: China, Germany, and India. The Czech Republic also manufactures ephedrine. This would enable the federal government to see where pseudoephedrine and ephedrine are going around the world, not just to Mexico, but potentially yet other countries that could become conduits for illicit diversion of pseudoephedrine. The ephedrine and pseudoephedrine that's going into Mexico now, where is that coming from? It's coming from, primarily, India, Germany, and China. That's where it's manufactured, and it's roughly in equal parts from those three countries. Is Mexican meth a new phenomenon, or are we just starting to pay attention to it? The physical location of meth super labs run by Mexican cartels in Mexico is a relatively recent phenomenon. It's really arisen in the past three or four years. The role of Mexican cartels as the dominant source of meth goes way back to the late 80s, early 90s. It's just that in the past, they had much of their production centered in California. The shift has really been the movement of super labs from California to Mexico. In the early days, when they were using other routes to acquire first ephedrine and later pseudoephedrine, they found it convenient and logical to locate in California. But now, since the dominant source of their chemicals is Mexico itself, that's where they've gone to make the stuff. Is the Amezcua cartel still active? How are they moving the drugs into the United States? It appears that much of the production is centered in western Mexico, just based on seizure statistics. The western states of Jalisco and Sinaloa have a lot of activity. The pseudoephedrine pills are diverted from wholesalers and pharmacies all around western Mexico and find their way into the labs in Guadalajara or Culiacan, and on up to Tijuana. There are really two major routes for distribution. For the western market, a lot of it goes through Tijuana and San Diego, and up I-5 into the northwest. From the northwest, it filters down from major cities to smaller and smaller cities. For instance, up here from Portland, you might have couriers who then go to Yakima, which is a smaller city in Washington, and then down to small towns in eastern Washington. A lot of these areas have large populations of Mexican migrant workers, and of course most of the couriers are Mexican nationals working with the cartels. Then the other route is, from the west coast of Mexico, the drug is transported north to Texas, and they make the crossing at Brownsville or other major points of entry. Often, the drugs are kept in hidden compartments within vehicles. Usually we're talking about just an ordinary passenger car or pickup truck. And you may have 10-, 20-, 100-pound quantities in baggies, or bricks of drugs in these very elaborate compartments of cars. And oftentimes, meth is transported along with a load of heroin or cocaine or marijuana, or all of the above. It makes the crossing into Texas, and in some cases, it's delivered to big cities in Texas like Dallas and Houston, and then repackaged and distributed to points north, like Illinois, Missouri. But I've also heard that in some cases, to avoid law enforcement in Texas, they'll make a run straight across the south to Atlanta. And Atlanta has become one of the most prominent distribution centers for the southeastern United States. Moves from Atlanta, in some cases heads back west to Alabama or Mississippi, in other cases heads north to North Carolina, Tennessee, even New Jersey. If so many of the cartels are now moving meth, can meth be linked to the increased violence in the border towns? It's hard to say. There are a lot of other factors going on there. The biggest factor is the Fox government's efforts to decapitate the cartels by arresting some of their leaders. And that's caused a power struggle for who is going to be the next dominant cartel, particularly between the Juarez and the Gulf cartels. So I think that's the main thing that's going on. I wouldn't link it directly to meth. Is addiction becoming a problem within Mexico? Are they having the problem now with people building their own labs as a result, or is the meth just coming straight from the cartels? I'm not too familiar with the small labs being a problem there. I think there's so much available, so cheaply, that that's how poor people in Mexico are able to obtain it. In many cases, the cartels will pay mules in drugs, as opposed to in cash. So that's why some experts think that meth has become particularly a problem in border towns like Tijuana. Are the reforms that Mexico has proposed enough to solve the problem? That's a good question. They've targeted the legal importation of pseudoephedrine, so it will be harder for the cartels to obtain their raw materials from that route, and it will force them, increasingly, to smuggle the chemicals into the country, or to locate their production in another country that hasn't taken the steps that Mexico has. But all of this raises the cost of black market pseudoephedrine, which has the potential for having a real impact on the marketplace in the United States, since the black market price of pseudoephedrine is actually a significant component in the street price of meth. Wouldn't the cartels adapt again to new restrictions? I'm sure they're in the process of seeking new sources. There have been signs of unusual bursts of shipments to smaller countries in Latin America, and in other parts of the world, that suggest that the cartels are exploring new routes. And another possibility is, you have a great deal of production of meth in Asia, for the Asian market. And if it became difficult enough to obtain chemicals in the Western hemisphere, there's always a possibility that the Mexicans could adapt by acquiring finished meth from Asian sources. Will the reforms really have any impact, given Mexico's corrupt reputation? The people I've spoken with in the U.S. government, and in law enforcement in particular, seem to have a reasonable amount of faith in the Mexican Health Ministry, which is responsible for regulating the importation and sale of pseudoephedrine. That's not something they necessarily say about all levels of Mexican government, or all divisions of Mexican government. But this particular Ministry, and the particular individuals involved, are known to the U.S. government, and on some level are trusted by them. Do you think U.S. lawmakers realize meth is a problem, and that the Combat Meth Act is a bill that would help things? I think there's an increasing realization among members of Congress, particularly those in the meth caucus, that domestic controls alone will only affect one portion of the meth problem, and that is local meth labs, and that the dominant source is Mexican cartels, and therefore this is an international problem that requires, potentially, changes in U.S. foreign policy, or changes in terms of multilateral agreements with international organizations. I've heard that a lot from the people who are really active on this issue in Congress. And is there an opposing side to it? Are there people against it? The primary objections have come from the State Department, and the main provision that concerns them is this notion of potentially withdrawing aid to Mexico and other countries that are involved in the pseudoephedrine trade. They feel that this would harm the relationship that the United States has developed with Mexico, and that a more collaborative approach is preferable. But in terms of the industry, these international measures actually are strongly supported by people such as the chain drug stores, and the over-the-counter medicine industry in the United States, as reasonable steps that go after, as they point out, the bigger source of supply. They say this, of course, because they may find it preferable to increased regulation of their products in the United States.